I Just Can't Cut It! I found the model I want to work with in the "More Stewart Toroids" folder. It's called the Icosahedra 8 (ring). The problem is that I want to reposition this model so that the conjuncture creates a more circular arrangement, and I get an error and the software has to quit, when I try to use the cut tool. I'm curious why the arrangement I'm referring to is not already preset. It's a more satisfying arrangement, and it is possible. How can I cut the existing model without getting an error, and how do you rejoin everything after you've re-positioned them? Cutting mode is for redesigning nets only, it can not be used to change the model itself. Could you tell me what edges you cut to cause the error though? 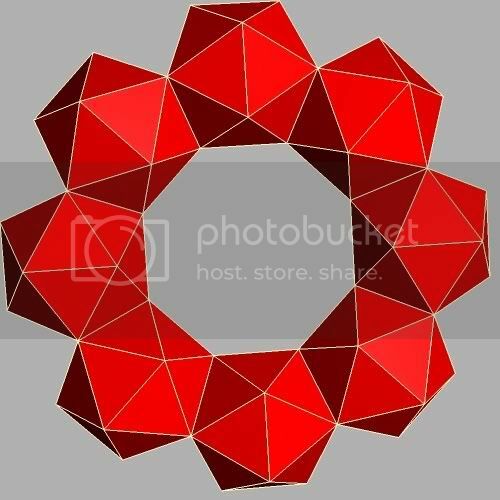 Or are your icosahedra only edge-connected rather than face-connected? 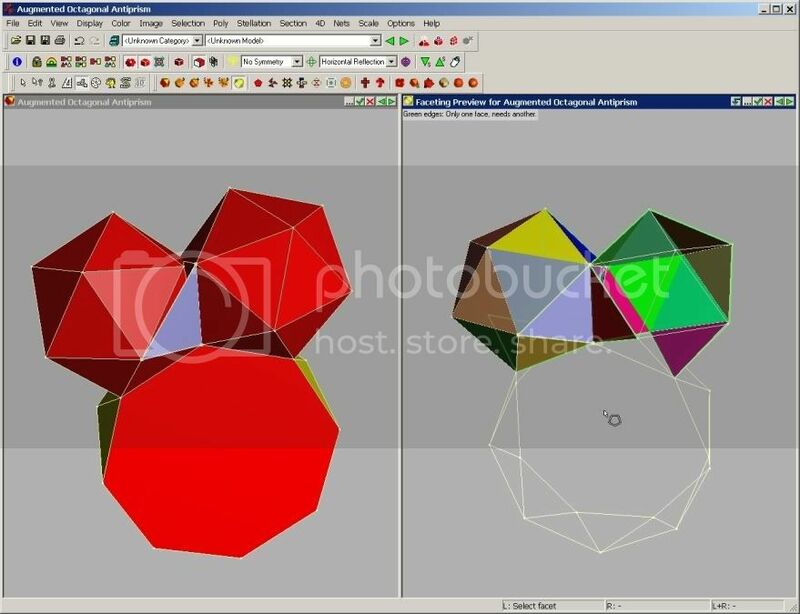 My model, if you were to try it yourself with eight icosahedra, is connected by the faces. In fact, in my Bryce 5, I was trying to do the math to rotate and position them correctly, and have only gotten a little ways along. I was hoping that once I oriented the first one properly, I could use the "multi-replicate" feature to generate the other seven automagically, rotating them as it is generating. There are 30-degree angles, 45-degree angles, and who knows what else? In attempting to cut the preset Stewart toroid, I was aiming for the edges next to the two icosahedra on the right and left; the ones that don't conjoin to the like face that the other ones do. That's funny that they wouldn't have continued the pattern. I don't know enough about geometry to call all these edges and faces by their values, but don't you see how the face that you must choose to join one to the next is the same set of faces for each one? That the symmetry is obvious, and the asymmetry of their choice in the preset is also obvious? I'm very curious how you got to the point that you did, and why it wouldn't come around full circle. When I confronted George W. Hart with this problem, he cryptically warned me that this was not an "exact" arrangement; and I don't know how to ponder that. It would seem to me, since the structure is so beautifully whole, that there must be exact math to its make-up. I suspect somewhere in the formula, there is a margin of error - "flex" - that makes it happen. It is magical though, don't you think? Now, the really cool thing is that I've discovered how to dissect the thing so that it can be made from one piece. That's all I'm going to say about that for now, as I have huge plans. If anyone is interested, I'd entertain business partners. This has me really curious. Can you somehow go the next step and make it close? Can you "make them "flex into place?" Ultimately, I wish to create a short animation that demonstrates the folding and unfolding of this one-piece model. Can anyone help? It could be worth $$. George Hart's comment that it's not exact seems to confirm what I found, that the model doesn't really exist using regular icosahedra. The icosahedra must be distorted in order to force the loop to close. That's not so easy to make happen in Stella. Thinking about it, you need an angle of 45 degrees between the two faces that an icosahedron attaches at. This angle is actually about 41.81 degrees. Re: OH! Isn't that BEAUTIFUL? RexEveryhting wrote: In attempting to cut the preset Stewart toroid, I was aiming for the edges next to the two icosahedra on the right and left; the ones that don't conjoin to the like face that the other ones do. Ah, I found how to do it and have fixed it (am in the middle of changes though so you won't see the fix for a while). 41.81 degrees- How Magical Is That? I marvel at the hidden enigma that keeps this thing from being precisely symmetrical. I know some mathematicians could have some heated arguments over it until they all settled on some obscure postulate that puts it in its proper place. I wonder why something like this can happen. I guess in the real world, you can't see that you're flexing them to get them to join full circle, but look at it when it's completed. Doesn't it seem like the math is inherently discrete? An octagon is so very regular. Why isn't this? I'm anxious to take my idea to market. I wish I could show you the net (one single piece,) that results from dissecting this construction. It too, probably has a mathematical "flaw" in it, and i don't want to get so deeply immersed into this project, only to find that this irregularity will thwart all my efforts. Do You Think You Know PHP? To get an 8-ring you have to augment the model by itself at the yellow faces. Nice job Ulrich. How did you do it? Rex forwarded the .stel files to me. 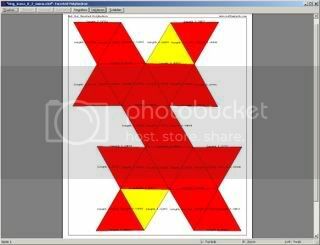 They fail when attempting stellation (of the single icosahedron) due to inaccuracies. It seems some edge lengths that should be equal are only accurate to within 6 decimal places (Stella prefers 10 or more). So I'm wondering how you made this model. I did it by augmenting an 8-fold antiprism by icosahedra. Then I faceted new icosahedra, taking care that two neighboured ones use the same set of vertices of the triangle they are both connected to. 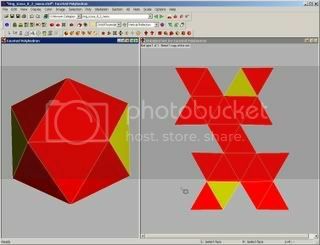 This results in icosahedra with some distorted triangles. After creation of the ring, I had stella try to make faces regular. From this I faceted one distorted monomer icosahedron which can be used to form a rather accurately closed 8-fold ring. This works with other Antiprisms too. Ah, very clever! It seems to be the try-to-make-faces-regular step that introduces inaccuracies. I am now able to attempt to light my lamp from within. I placed eight little glowing balls inside the structure and have been experimenting with the intensity and the image gels. Picture this hanging on a door at Christmas-time, perhaps a rope-light making up the inner illumination, or even better, I've had ideas of using electroluminescence or LEDs, perhaps something that recharges only from the daily sunlight and lasts through the night on a day's charge. I've transformed this idea over about 5 years. It's still transforming. The fact that it is comprised of irregular icosahedra shocked me. It just seemed as if it was obvious and mathematically sound with even angles. I wonder how magical the formula is that gives it the wholeness.